Mohamed was an excellent host at the guest house in tinghir, the view from our room in the morning was spectacular, probably not changed since Jesus was a lad, Mohamed told us that his grand fathers house around the corner was 3000 years old, what an incredible age. Probably one of the less eventful days so far, roads were good, we saw camels, in fact we almost ran them over and an accident was only prevented by the Shepard girl with agressive stick waving. Good to see the camels though. Apart from a couple of minor issues with the car alternator and the constant battle with overheating it was a relatively easy day in the Sadle. We arrived at our hotel at around 5 pm 67 euros for three twin rooms, happy days. It is a large modern hotel with a large out door swimming pool all rooms en-suite, good value but in comparison to last night, a featureless event. We went out for something to eat which was 50 euros for six of us and spent an hour discussing plans to get back to marakesh in time to meet the girls. 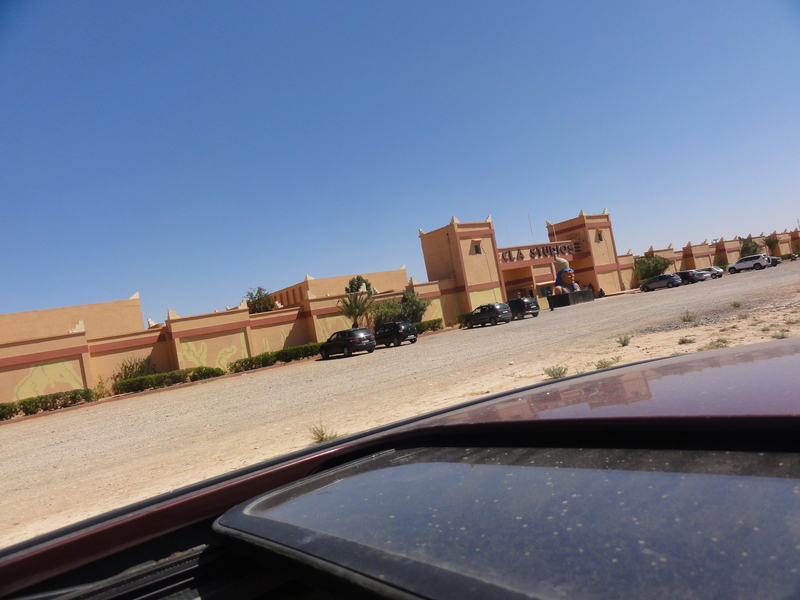 Here is the plan, tomorrow we aim to get to Laayoune, the next day we aim to go to the tropic and back to Daklah for the night, that will be a big drive, the next day Dakhla to tan tan then on to marakesch for Saturday. We have a long way to go and maybe we should have done more miles today to free up time later on. We are where we are and we are all still enjoying the trip. I wanted to stay in Daklah since we planned this trip but it is around seventy to one hundred miles out of our way, we are all happy to do that. Morocco is largely dry so the chance of a pint at the end of the day is not guaranteed, last night we had a bit of scotch left, tonight we have had a couple of bottles of beer in the hotel bar but I think we are the only guests using the service, the bar is located by the pool but they seem happy to bring us a drink into the hotel. Here is how things go for me and mark as a daily routine of getting to where we need to be, Some time prior to setting off, we check oil and water and adjust accordingly, given our overheating issues, this is a pretty important activity, the car has to keep going to get us out of morocco otherwise we will be heavily taxed as it becomes an import, or we are fined for dumping it. Once on the road we generally set the sat nav to show altitude, this is important as the higher we go the thinner the air and cooler it gets, giving us an advantage with cooling, also we know once we are above 1000m we are not going to go much higher in this area, the highest we have been on this trip is 2202 m, this is the highest my car has ever been, prior to this, it was 1900m in the alps on the Asia trip. Once we are on the road we manage the overheating using the manual fan switch and if it still gets high we have to resort to the cabin heating to disperse engine heat. This is hard work having the heater on at noon in the Sahara. I normally start the first driving shift and mark takes photos as we drive along , we generally split the drive into roughly two halves. We normally stop for dinner at around 3pm and get a snack mid morning, fuel is as and when available. It costs around £35 to fill up. For lunch we have noodles and stir fried veg, it’s good, and very quick to prepare. The car is running at about 53mpg. We haven’t seen much of agadir but is seems live a fairly modern city well developed and clean and tidy with a strong leaning towards tourism and service industry for the area. It’s not a place we would come back too, it lacks the culture of the other places we have stayed. But it give contrast to the trip. 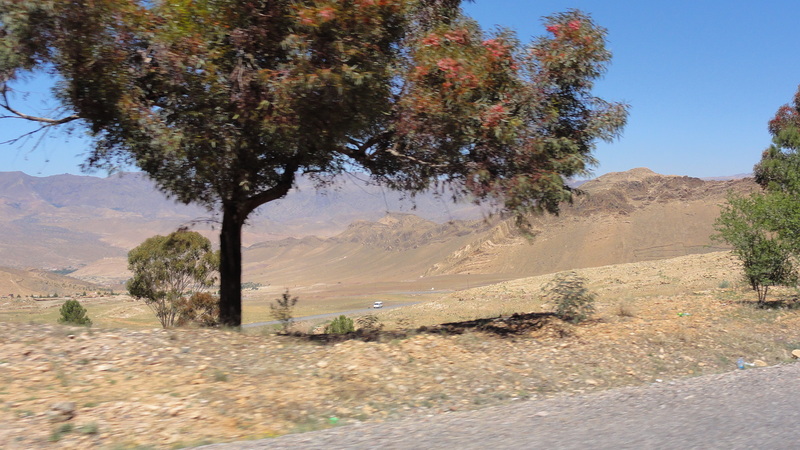 We saw, on our way into the agadir a pick up truck with a camel in the back. The camels head was poking out of the top and looking at the traffic as the pick up went along. If you don’t see any changes to the web site, place pres control F5 to refresh the page. I think today for the first time in a long time I have started to look forward to the trip. I have a vague feeling that we are going to have a real adventure. I have heard today that the riff value in northern morocco is a bit of an issue with cannabis cultivation a significant wealth creator. There is word that it can be a violent area and should be avoided at night. Given the preferred cash crop it surprises me that they can be bothered to be violent, we expect to be through the riff valley within a day of landing in Africa. I have a fridge. I made it out of a wooden box and some bits off another fridge. It will hook up to the power in the boot of the astra and keep food and drink cool. It’s not very powerful so I have frozen a bottle of water to get it started , perhaps the fridge will keep it cool. Thanks to F.T. For the original fridge. Photos to follow. The kitchenette now not only includes a fridge but a work top, a two ring stove and, just installed, a drawer. The drawer, like many kitchen drawers is already full of non kitchen related stuff, spinners, insulation tape, etc. It is less that 48hours till we leave, the trip that was originally planned on our way out,of Telford on our way to Asia last year. I am most looking forward to looking at the stars in the Sahara, sticking more flags on the fender, cooking up lunch in the astra kitchenette .